There's a Party in my City! Get your tix to Yo Gabba Gabba! YO GABBA GABBA! LIVE! : THERE’S A PARTY IN MY CITY! Tickets are onsale NOW! Get em' quick cause they're sure to sell out! PHILADELPHIA (May 19, 2010) -- Fresh off a triumphant sold-out tour debut, a headlining performance at The White House, a critically-acclaimed, chart-topping album, and an appearance at Coachella that garnered rave reviews from spectators and media alike, DJ Lance Rock and the cast of YO GABBA GABBA! 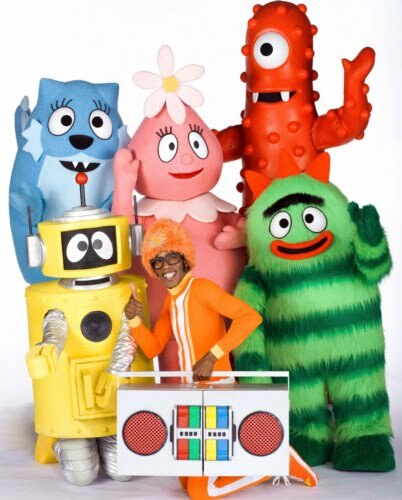 are heading back on the road with YO GABBA GABBA! LIVE! : THERE’S A PARTY IN MY CITY! to play to enthusiastic fans in Philadelphia. Today’s hottest live show for families will be at the Mann Center on August 29th for two shows. YO GABBA GABBA! LIVE! : THERE’S A PARTY IN MY CITY! is produced by S2BN Entertainment in association with Wildbrain Entertainment and The Magic Store and promoted by AEG Live & The Mann Center. Champions on the stage and in the community, the Gabba Gang will partner with Habitat for Humanity to further their homebuilding efforts in Philadelphia. In addition, $1 from every ticket sold for YO GABBA GABBA! LIVE! : THERE’S A PARTY IN MY CITY! in Philadelphia will be donated to the local Habitat for Humanity affiliate. VIP packages with premium tickets and meet and greets are also available. For complete tour, ticket information and VIP packages, visit www.yogabbagabbalive.com. Children under one year of age will be admitted free to sit on a parent’s lap. Los Angeles, CA-- Fresh off a triumphant sold-out tour debut, a headlining performance at The White House, a critically-acclaimed, chart-topping album, and an appearance at Coachella that garnered rave reviews from spectators and media alike, DJ Lance Rock and the cast of YO GABBA GABBA! are heading back on the road with YO GABBA GABBA! LIVE! : THERE’S A PARTY IN MY CITY! to play to enthusiastic fans on a 60-city tour across North America. Today’s hottest live show for families will make stops at top theaters, arenas and amphitheaters throughout North America, starting August 27 in Bethel, NY and ending in Dallas, TX on December 12. YO GABBA GABBA! LIVE! : THERE’S A PARTY IN MY CITY! is produced by S2BN Entertainment in association with Wildbrain Entertainment and The Magic Store. THERE’S A PARTY IN MY CITY North American tour will be donated to the Habitat for Humanity local affiliate in each tour city, to further their homebuilding efforts. The state-of-the-art production features music, singing, dancing and animation. The show is an interactive experience that offers audience members of all ages the opportunity to witness their favorite characters come to life. Joining the characters on stage will be hip-hop legend Biz Markie to teach kids how to beat box with “Biz’s Beat of the Day.” Special guests will join the party on stage for the Super Music Friends Show and Dancey Dance segments.